Not to be confused with Charles A. Bachman. 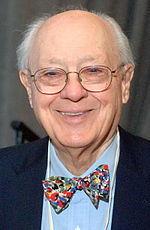 Charles William Bachman III (Born on December 11, 1924 – July 13, 2017) was an American computer scientist, who spent his entire career as an industrial researcher, developer, and manager rather than in academia. He was particularly known for his work in the early development of database management systems. His techniques of layered architecture include his namesake Bachman diagrams. Charles Bachman was born in Manhattan, Kansas, in 1924, where his father, Charles Bachman Jr., was the head football coach at Kansas State College. He attended high school in East Lansing, Michigan. In World War II he joined the United States Army and spent March 1944 through February 1946 in the South West Pacific Theater serving in the Anti-Aircraft Artillery Corps in New Guinea, Australia, and the Philippine Islands. There he was first exposed to and used fire control computers for aiming 90 mm guns. After his discharge in 1946 he attended Michigan State College and graduated in 1948 with a bachelor's degree in Mechanical Engineering where he was a member of Tau Beta Pi. In mid-1949 he married Connie Hadley. He then attended the University of Pennsylvania. In 1950, he graduated with a master's degree in Mechanical Engineering, and had also completed three-quarters of the requirements for an MBA from the university's Wharton School of Business. Bachman died on July 13, 2017, at his home in Lexington, Massachusetts, of Parkinson's disease at the age of 92. Bachman spent his entire career as a practicing software engineer or manager in industry rather than in academia. In 1950 he started working at Dow Chemical in Midland, Michigan. In 1957 he became Dow's first data processing manager. He worked with the IBM user group SHARE on developing a new version of report generator software, which became known as 9PAC. However, the planned IBM 709 order was cancelled before it arrived. In 1960 he joined General Electric, where by 1963 he developed the Integrated Data Store (IDS), one of the first database management systems using what came to be known as the navigational database model, in the Manufacturing Information And Control System (MIACS) product. Working for customer Weyerhaeuser Lumber, he developed the first multiprogramming network access to the IDS database, an early online transaction processing system called WEYCOS in 1965. Later at GE he developed the "dataBasic" product that offered database support to Basic language timesharing users. In 1970, GE sold its computer business to Honeywell Information Systems, so he and his family moved from Phoenix, Arizona to Lexington, Massachusetts. In 1981, he joined a smaller firm, Cullinane Information Systems (later Cullinet), which offered a version of IDS that was called IDMS and supported IBM mainframes. optimization of physical database designs for performance and DBMS specifics. In 1991 Bachman Information Systems had their initial public offering, trading on the NASDAQ with the symbol BACH. After reaching a high of $37.75 in February 1992, the price hit $1.75 in 1995. In 1996, his company merged with Cadre Technology to form Cayenne Software. He served as president of the combined company for a year, and then retired to Tucson, Arizona. He continued to serve as chairman of the board of Cayenne, which was acquired by Sterling Software in 1998. He received the Turing Award from the Association for Computing Machinery (ACM) in 1973 for "his outstanding contributions to database technology". He was elected as a Distinguished Fellow of the British Computer Society in 1977 for his pioneering work in database systems. He was awarded a National Medal of Technology and Innovation (2012) "for fundamental inventions in database management, transaction processing, and software engineering." In 2015, he was made a Fellow  of the Computer History Museum for his early work on developing database systems. After his retirement, Bachman volunteered to help record the history of early software development. In 2002 he gave a lecture at the Computer History Museum on assembling the Integrated Data Store, and an oral history for the ACM in 2004. Bachman papers from 1951 to 2007 are available from the Charles Babbage Institute at the University of Minnesota. In 2011, he contributed an oral history to the Institute of Electrical and Electronics Engineers. ^ Jean-Baptiste Waldner (1992). CIM: Principles of Computer Integrated Manufacturing. John Wiley & Sons. ^ a b c "Lectures: Charles W. (Charlie) Bachman". Computer History Museum. Archived from the original on June 4, 2004. Retrieved September 3, 2013. ^ Thomas Haigh (October 2011). 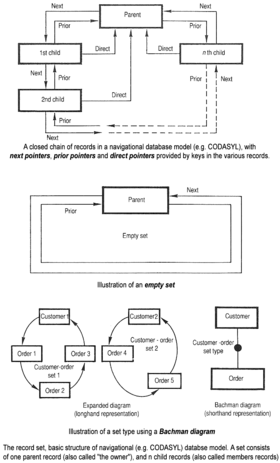 "Charles W. Bachman: Database Software Pioneer" (PDF). Annals of the History of Computing. IEEE. 23 (4): 71–80. doi:10.1109/MAHC.2011.68. Retrieved September 3, 2013. ^ Harrison Smith (July 16, 2017). "Charles Bachman, engineer who devised a better way to manage data, dies at 92". The Washington Post. Retrieved July 16, 2017. ^ a b Thomas Haigh (September 25–26, 2004). "Charles W. Bachman interview". ACM Oral History interviews. doi:10.1145/1141880.1141882. ISBN 978-1-4503-1771-9. ^ a b c Andrew L. Russell (April 9, 2011). "Oral-History:Charles Bachman". IEEE Oral History Network. Retrieved September 3, 2013. ^ "Proxy Statement for Bachman Information Systems, Inc". US SEC. March 25, 1996. Retrieved September 3, 2013. ^ "Sterling software announces agreement to purchase Cayenne Software". Press release. August 31, 1998. Retrieved September 3, 2013. ^ Tom Haigh. "Charles W. Bachman — A.M. Turing Award Winner". Retrieved September 3, 2013. ^ a b "Charles W. Bachman Papers, 1951—". Charles Babbage Institute, University of Minnesota. Collection contains archival materials detailing database software development. Includes documentation on Dow Chemical (1951-1960), General Electric (1960-1970), Honeywell Information Systems (1970-1981), Cullinane Database Systems/Cullinet (1972-1986), Bachman Information Systems, Inc. (1982-1996), Association for Computing Machinery (ACM) (1971-1982), American National Standards Institute (ANSI) (1978-1983) as well as several international standard organizations. ^ "Assembling the Integrated Data Store (IDS), lecture by Charlie Bachman". Computer History Museum. April 16, 2002. Retrieved September 3, 2013.